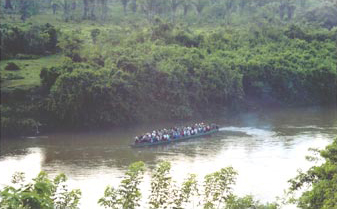 The 'port' is large, natural gully located in the northeast sector of the Classic period Maya city of Cancuén, in the upper Pasión region of Guatemala's Petén state (Figure 1). The topographical depression receives drainage from a small area of 31,400 m2, in which several residential structures have been uncovered (Figure 2 and Figure 3). This feature first came to the attention of archaeologists as the possible location of the city's former river port, where vessels from the Río Pasión could be loaded and unloaded of the highly prized objects created by the city's inhabitants (Cook et al., 2005). Instead of finding evidence of trade, and related structures, excavators Alvarado et al. (2003) uncovered signs of death and upheaval; skeletal remains unceremoniously dumped in the natural depression in the landscape, which has since been buried by metres of soils eroded in from the surrounding site. In 2004, a detailed excavation of the 'port' area was undertaken by researchers from Vanderbilt University (excavation CAN38-49-14), in an attempt to understand the scale of human remains in these sediments, the spatial distribution of them, and to try and understand how a mass burial came to be there. As one of only a few topographical depressions at Cancuén, this location offered a unique opportunity to examine humanenvironmental interactions during the entire history of a Mayan city. As the gully has infilled through time, soils eroded from the surrounding catchment have been deposited sequentially, and preserved. These sediments have the potential to preserve parallel records of archaeological and palaeoenvironmental history, allowing the rare opportunity to develop a scientific record of how the Classic period Maya and their environment had co-evolved during the Classic period in this region. As the sediments deposited in the gully span both pre- and post-Maya civilization, both the beginning and end of human activity at Cancuén was potentially recorded. Detailed analysis of these sediments then could provide answers to questions of the age of the city's construction, abandonment, and the environmental conditions that prevailed in the lowland southern Petén site throughout this period.